Bryan McCabe was great on the powerplay during the first half of the 2005 season. 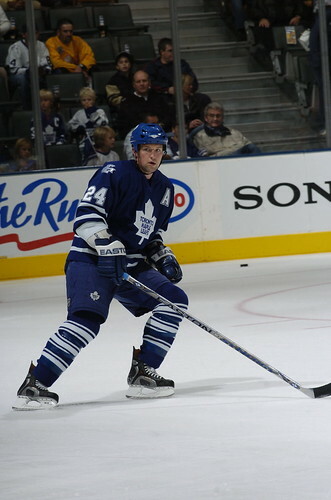 His play during that period earned him a spot on the 2006 Olympic team, made him a Norris trophy candidate and had many Leafs fans touting him as the next Al MacInnis or Scott Niedermayer. That play also earned him a massive five-year, US$28.75-million contract with a no-move clause from John Ferguson, Jr. These past few days we've been reading about how Bryan McCabe will never play another game for the Leafs. The Leafs desperately want to trade him, but he won't waive his no-trade clause. He might live on Long Island, but he knows the Leafs are screwed and have to buy him out to get rid of him. The Leafs would have to pay McCabe two-thirds of what he is owed - almost $3-million per season - plus a reported $2-million bonus due on September 15. Uncle Cliffy and the gang don't like the sounds of that. As a result, it looks like we're in for some hardball. Some reports suggest Uncle Cliffy will order McCabe to stay away from training camp. In essence we'll be paying McCabe not to play in the hopes he'll agree to a trade in the best interest of his career. All of this has Leafs fans burning their McCabe jerseys and begging him to accept a trade. McCabe must be selfish because he's actually asking MLSE to own up to the contract they approved in good faith. JFJ dug this hole but MLSE blessed the transaction. A deal is a deal, right? As this gets uglier with a guy who covered his defensive lapses with a scoring touch for half a season the blogosphere and fan base will label McCabe a selfish jerk who shouldn't want to play where he's not wanted. This might be true, but we can't blame McCabe. This is the doing of JFJ and MLSE. You are correct sir. Blaming McCabe is silly. If my comapny offered me a No Trade contract at way more than I am worth I'll sign in a heart beat. And will expect them to live up to the contract no matter what.